The traditional way to make muhammara, a classic Syrian spread, is with roasted peppers, but this delicious version swaps in earthy beets. Its vibrant color, matched by its deep flavor, will get everyone at your next party talking. 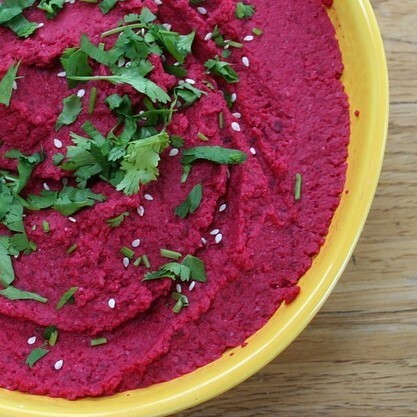 Serve with pitas or crackers as an exciting alternative to hummus. Pack this up in a small Tupperware for the little ones and send it off to school or work with a bunch of pita slices and or vegetable sticks. Preheat the oven to 400° F. Trim and peel the beets and cut them into large chunks. Place the beets on a rimmed baking sheet and toss with a drizzle of olive oil. Roast for 30-40 minutes, until fork-tender. Remove baking sheet from the oven and allow beets to cool. Add the cooled beets, chopped walnuts, dill, creme fraiche, vinegar and caraway seeds to a food processor and process until smooth. Season with salt and pepper. To serve, drizzle the top of the dip with some olive oil and garnish it with a sprig of dill. Serve with crackers, chips, toast points or raw vegetables. This entry was posted in Food, Harlem, Recipe and tagged #harlemworldmagazine, Down to Earth Markets, Recipe, Roasted Beet & Walnut Dip by Harlem World Magazine. Bookmark the permalink.